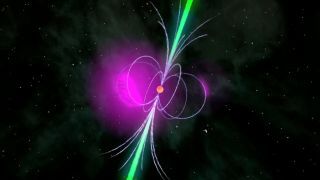 A gamma-ray pulsar is a compact neutron star that accelerates charged particles to relativistic speeds in its extremely strong magnetic field. An odd, hiccuping pulsar (shown in this illustration) was discovered in July 2012 that sped up a small bit, causing it to be missed initially by searching scientists. Astronomers have discovered a weird compact spinning star whose rotation has sped up slightly, causing it to be hidden until now. The star is what's called a pulsar, made of the condensed remnants of a normal star that have been squeezed down to a much smaller volume. This compression has caused the star's rotation to accelerate to roughly seven times a second. Pulsars are so called because they appear to pulse on and off, as beams of light pointing from their poles sweep toward Earth and away. The newly discovered pulsar, designated J1838-0537, is a rare type that emits light only in the high-energy gamma-ray range of the electromagnetic spectrum. The researchers discovered it by analyzing data collected by the Fermi Gamma-ray Space Telescope. Pletsch is lead author of a paper describing the find, which will be published in an upcoming issue of the Astrophysical Journal Letters. "After the discovery we were very surprised that the pulsar was initially only visible until September 2009," Pletsch said. "Then it seemed to suddenly disappear." Careful analysis showed that the pulsar did not actually vanish, but in fact sped up its rotation by about 38 millionths of a Hertz (a unit of frequency denoting the number of cycles per second). "This difference may appear negligibly small, but it's the largest glitch ever measured for a pure gamma-ray pulsar," said Bruce Allen, director of the Albert Einstein Institute. That meant that the next beam wasn't there when the scientists were expecting it, so it wasn't noticed in the deluge of data collected by the Fermi telescope. In other words, the pulsar stopped pulsing. "If the sudden frequency change is neglected, then after only eight hours, a complete rotation of the pulsar is lost in our counting, and we can no longer determine at which rotational phase the gamma-ray photons reach the detector aboard Fermi," Pletsch explained. Once the change was taken into account, though, the researchers located the pulsar. Such glitches have been observed in other pulsars before, but their cause is unknown. One idea is that "star quakes" on the surfaces of pulsars affect the change in rotation speed, or that the glitch is caused by interactions between the stars' fluid interiors and crusts. This oddball pulsar was only discovered by harnessing the analysis power of new algorithms on the superfast ATLAS computer cluster. The researchers hope that the system will uncover more "hiccupping" pulsars to help elucidate how they work.